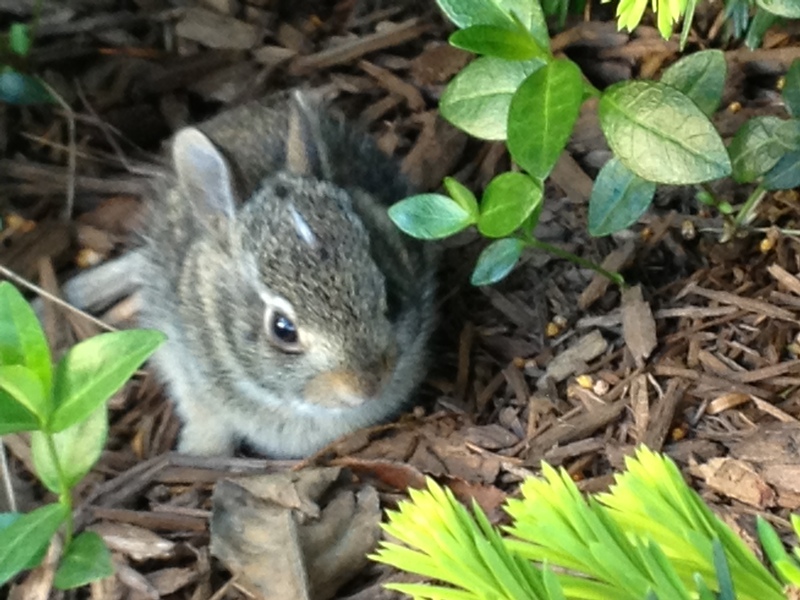 I was recently out walking my yard with a landscape contractor when I spotted a baby rabbit hiding out in my ground cover. He stayed still long enough for me to approach him and snap the above photo. He looks like a sweet innocent little guy, but I know he will probably be helping himself to my annuals and perennials very soon, if he hasn’t already. I used to get upset when I would see rabbits in my yard eating my landscaping. In fact, at one time, I purchased a live “no-kill” trap to capture them and relocate them to my local forest preserve. However, the trapping came to an end one Saturday morning while I was rushing around the house getting ready to take clients out to look at homes. I was sitting at my kitchen table enjoying breakfast when I noticed I had caught something overnight. The excitement came to an end when I walked over the back window and noticed I had caught a black and white rabbit. It took me a moment to realize there was a baby skunk in the trap and he didn’t look very happy. After I had calmed myself down, I started to go through the phone book looking for someone to remove this skunk. I remembered I had seen a vehicle a few months prior with the words “Critter Getter” on the side of it. I laughed to myself when I initially saw it and thought who uses this type of service in the suburbs of Chicago. I now knew the answer to that question; it was idiots like me trying to trap rabbits. I had finally reached this “Critter Getter” guy and explained my situation. I had to listen to him lecture me about how I shouldn’t be trapping without a license. He then went on to tell me that this skunk was going to die if I didn’t get him out of the cage and the heat soon. My next logical question was “how much?” His response was “$100”. “Done”, I replied. I usually like to negotiate, but this time a hundred bucks sounded like a great deal. One would think that this would be the end of me trying to rid my yard of rabbits. I went on to try several other home remedies and store bought organic sprays. Some worked, but most of them didn’t. It seemed to change depending on the year. The quest to rid my yard of rabbits ended in the summer of 2006. It was about 2 weeks after I lost my son Noah. It was mid-June and I was still home from work after losing Noah and would be for another 2-3 months. I was not doing well but still managed to do some things around my house. My wife and I would stay up until midnight and would get up until around 10 AM. My wife also took that time off of work and we spent this time together trying to find our way through the pain of profound grief. Most people that know me know that I have a tendency to have very bizarre dreams from time to time. During one of these 10 hour sleep sessions, I had a dream that would forever change the way I look at these furry little guys. The dream was fairly short, but very vivid. In my dream, I remember looking into my back yard and seeing rabbits of different sizes and shapes standing (yes, standing on their back feet) out by my back fence. When I walked out to these rabbits, each one was standing on their back feet and holding a rifle into the air. I asked them what they were doing and one of them looked at me and said “we are giving Noah a 21 gun salute”. It took me several years to be able to tell that story without choking up. Ever since that dream I see rabbits differently. In fact, since the death of Noah, I have a new sense of respect and compassion for wildlife and nature in general. I believe Noah was a kind soul who would have come home with every stray in the neighborhood. I love and miss him greatly. Although I never got to know him, he continues to send me unexpected gifts. Thank you for sharing this story. First of all growing up where you did and who you grew up with, i am surprised you had to call for help to release the “black and white rabbit.”. Thank you for the kind words. As far as the strength goes, everyday is a new day and we made a decision early on that we could let this destroy us or we can become better. We choose better. The book is a heavy read, especially for someone that hasn’t lost a child, but it speaks the truth for the parents that have. To be honest, I am not sure I could read it if I didn’t understand or relate with it. The stories are heartbreaking but the message is clear. Live to honor your child. One of the only ways to survive this hell. Yeah, one would think that I could have handled the “black and white” rabbit. I probably could have but the last thing I needed was to get sprayed. Although that would have added to the story. There are a lot of people who think that black and white “rabbit” story is pretty funny. Looking back it’s another story to add to my life, a funny one at that. Thanks for the kind words. I have no doubt you would love to hear your sons voice again, although it may not be today or tomorrow, I am confident that will happen again. I am sure your prayer also brought your son peace. The voice of his dad praying for him was what he needed at that time. What I would not give to hear his now.